Located south-west of Albany, West Cape Howe houses the famous Shelley Beach, and Shelley Beach Lookout where platforms are built into the side of the hilltop for hang gliders and paragliders to launch. You can drive to West Cape Howe from Albany or Denmark in under thirty minutes. It is a slightly longer drive from Denmark in the west. View the rugged end of the state at Forsyth Bluff, or visit Cosy Corner just outside the National Park for a stroll along the white sandy beaches. If you intend to walk to Torbay Head, the southern-most point, it is a 15km round trip hike on undulating terrain with little shelter. The beginning of the walk is part of the Bibbulmun Track. Visit the West Cape Howe Map to get your bearings. Cliffs along the West Cape Howe coastline. 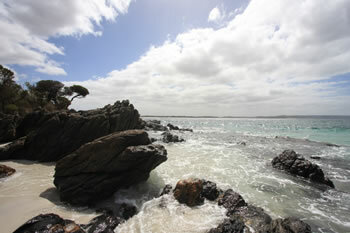 West Cape Howe has activities such as Hang Gliding or Paragliding, Fishing (and rock fishing) and bushwalking. The trails are well signposted throughout the park. 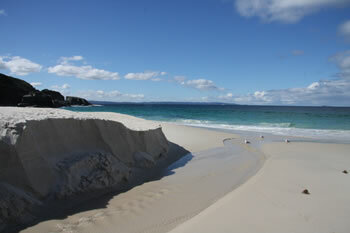 West Cape Howe National Park is half way between Albany and Denmark along the Lower Denmark Road. You will see the signs for West Cape Howe and Cosy Corner. 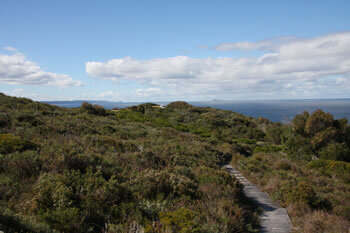 The Bibbulmun Track passes directly through West Cape Howe National Park on is way from Albany in the south to Perth in the north. 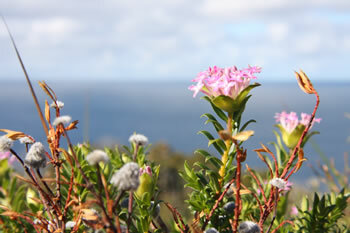 It traverses the Shelley Beach Lookout where the Track can be taken to Albany or towards Walpole. This thousand kilometre walking trail is one of the world's greatest long distance walking trails. More information can be found here: Bibbulmun Track. 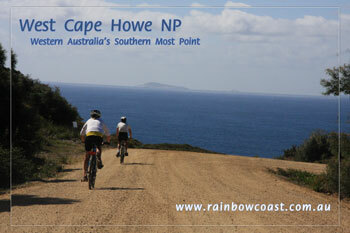 Cycling to Shelley Beach through West Cape Howe National Park is a thrilling experience. Hang gliders and paragliders have two custom built launch platforms built into the black granite headland above Shelley Beach at the lookout. Talk about amazing! 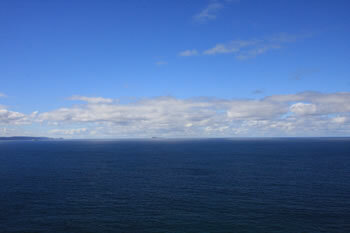 These launch platforms give an uninterupted view of West Cape Howe and Albany Wind Farm as well as Torndirrup Peninsula. Cosy Corner. The rocks between East and West. 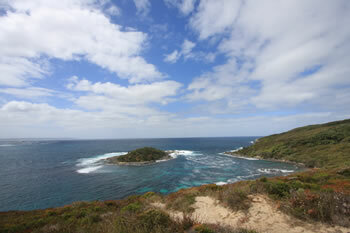 The Shelley Beach Lookout is easily accessed by 2wd vehicles. The Hang Gliding / Paragliding platforms at Shelley Beach Lookout. Albany is the nearest town, and is located only fifteen kilometres to the east along the Lower Denmark Road. Denmark is located only thirty five miles west of along the Lower Denmark Road.